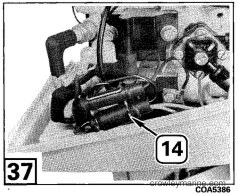 This kit contains the parts to install a dashboard or gunwale mounted emergency stop switch on 1982 (CN) and newer Johnson® and Evinrude® 4 Deluxe thru 55 model tiller steered outboard motors. The installation of this kit involves procedures described in detail in the Service Manual for your product. If you do not have the required literature and do not wish to purchase it, have this kit installed by your Evinrude/Johnson Dealer. To the Installer and the Owner INSTALLER: Give these instructions to the owner. OWNER: Keep these installation instructions with your Operator's Manual. You must perform the tests at the end of this instruction (Step. 8) periodically to maintain the protection of this product. Read installation instructions before starting work. Remove battery cables before starting work on motor or boat. Accidental contact with electrical wiring could cause injury. Accidental cranking of engine could cause personal injury from contact with moving parts. The emergency stop switch lanyard is 30 inches (760 mm) long. Select a switch location near and facing the boat operator. The lanyard must be clear of all controls and permit freedom of operator's arm and body movement when starting and operating the motor. The mounting surface must be solid and secure. It must be at least 5/8 in. (15 mm) thick if the screws provided are used. If the mounting surface is metal or thinner, use #10 flat head Phillips machine screws, flat washers and nuts (not provided). Place the bezel (1) at the selected location. Turn the bezel over, face against dash, and rotate so holes are at top left and bottom right. Mark switch and mounting screw holes. Center punch and drill three 3/32 in. (2,4 mm) holes. Enlarge switch hole with a 1 1/2 in. to 2 in. (38-50 mm) hole saw. Place bezel on switch (2). Install nut (3) and tighten to a torque of 28-48 in. lbs. (3,2-5,4 Nm). Position bezel with emergency stop switch symbol at the top. Fasten bezel to mounting surface with two screws (4). Cut out template. Cut out shaded areas. Position template over knobs and tape to lower motor cover. Mark hole location. Place shop cloth inside motor cover to catch chips. Drill a pilot hole and enlarge hole with 5/6 in. (16 mm) drill bit. Use a file to remove burrs. Remove cloth and chips from lower motor cover. Insert wiring harness (5) switch leads thru hole and fit preassembled grommet (6) into motor cover hole. Go to Step 7. Drill or cut an additional 1/4 in. (6,4 mm) hole thru the middle of the remote control grommet (A). Remove preassembled grommet (6) and Amphenol connector from wiring harness. Insert terminal end of wiring harness (B) thru hole in grommet with enough slack to reach connector location. Go to Step 7. Remove air silencer screws (C), and lift off air silencer cover. Turn low-speed knob (D) to centered position. Pry knob off with screwdriver. Remove air silencer base mounting screws and washers (E). Remove air silencer base. Leave choke dtent spring (F) in position. Remove black plug from front of lower motor cover and discard plug. Select grommet (7) with 1/2 in. (13 mm) diameter hole from kit. Insert grommet in lower motor cover. Remove preassembled grommet (6) and Amphenol connector from wiring harness (5). Route end of wiring harness (5) with three separate leads thru grommet (7) and long port side to rear of motor. Remove grommet (A) by carefully cutting from battery cables and discard grommet. Cut preassembled grommet (6) from wiring harness (5). Select grommet (8) with 5/8 in. (16 mm) diameter hole from kit. Install by cutting and placing over battery cables. Insert end of wiring harness with three separate leads thru grommet and along port side to rear of motor. The wiring harness must be positioned to prevent binding or contact with the throttle components (B). Reassemble air silencer, etc. Go to Step 7. Drill or cut an additional 1/4 in. (6,4 mm) hole at bottom of remote control grommet (C) (throttle cable location). Remove preassembled grommet (6) and Amphenol connector (D) from wiring harness (5). Insert terminal ends of wiring harness (5) thru grommet with enough slack to reach connector location. Go to Step 7. Place shop cloth inside motor cover to catch chips. Drill a pilot hole and enlarge hole with 5/8 in. (16 mm) drill bit. Use a file to remove burrs. Remove cloth and chips from lower motor cover. Insert wiring harness (5) switch leads thru hole and fit preassembled grommet (6) into motor cover hole. Route wires along starboard side to rear of motor. Go to Step 7. Remove screws and clamp (A) from lower motor cover. Remove and discard solid plug (B). 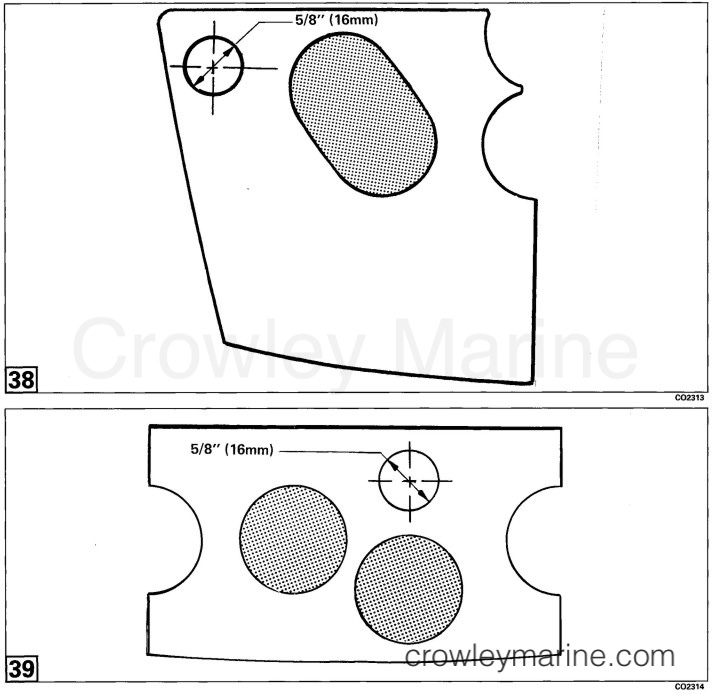 Select two grommet halves (9) from hardware kit and place one in lower motor cover pocket (C). Cut preassembled grommet (6) from wiring harness (5). Route wiring harness over grommet half, under carburetors and shift lever, and along starboard side to rear of motor. Apply RTV to both grooves (D) and wires in the grommet. Place other grommet half over wires and reinstall clamp and screws. Models with AC lighting have an AC lighting plug secured by the above clamp. 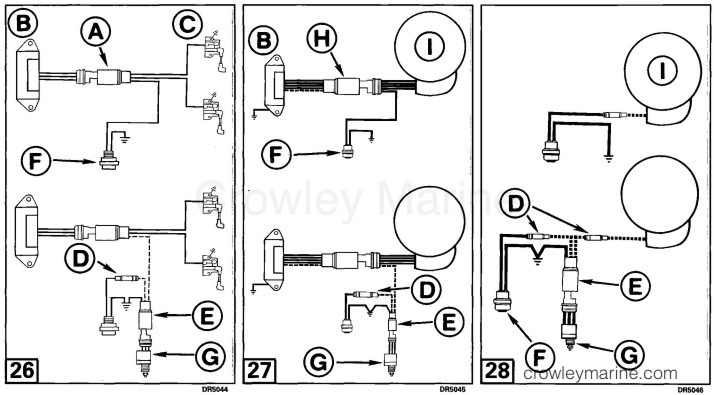 1989 and newer manual start models have the primer located in the clamp. If you are working one of these motors, drill a 5/8 in. (16 mm) hole (E) behind the clamp. Install the wiring harness (5) thru the drilled hole, and insert the preassembled grommet (6) in the motor cover. 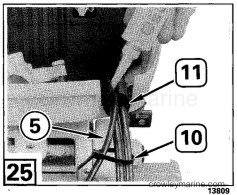 Use tie strap (10) to hold wiring harness to tiller arm, away from transom bracket. Remove two grommet halves (F) and discard grommet. Cut preassembled grommet (6) from wiring harness (5). Select grommet (11) from hardware kit and discard other grommets. Install battery cables and wiring harness (5) in grommet. Route wiring harness under carburetors and shift lever along starboard side to rear of motor. Apply RTV to battery cables and wiring harness in grommet and reinstall clamp and screws. Secure wiring harness to battery cable with tie strap (10). 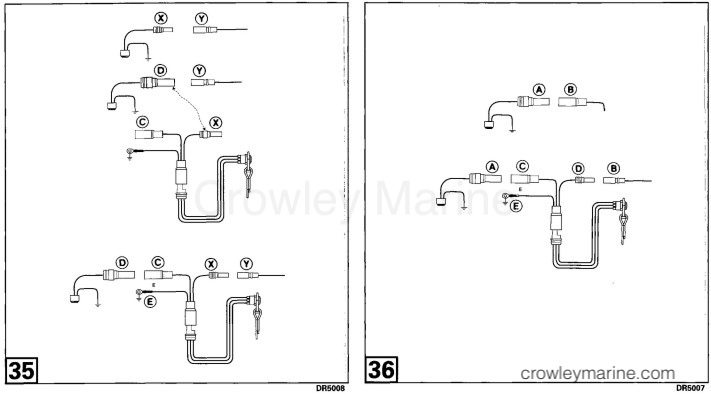 Review wiring diagrams for modifications to install emergency stop switch in system. 1982 - 1984 (CN - CR) CDII Models: Original circuit, and circuit with emergency stop switch installed. 1985 - 1990 (CO - ES) CDII, and 1992 (EN) and Newer CDII Models: Original circuit, and circuit with emergency stop switch installed. 1989 (CE) and Newer UFI Models: Original circuit, and circuit with emergency stop switch installed. Older models have a smaller plug and receptacle than those supplied. See Fig. 35, and Fig. 36 for assembly information. Remove black or black/yellow wire stop button pin (A) from "A" CAVITY (B) of three-wire motor receptacle (C). Install black/yellow wire socket (D) on wiring harness (5) into single-wire plug (12) from hardware kit. Remove single-wire receptacle (E) from black/yellow wire pin (F) on wiring harness (5). Install single-wire receptacle (E) onto black or black/yellow wire stop button pin (A). Install black/yellow wire pin (F) on wiring harness (5) into "A" CAVITY (B) of three-wire receptacle (G). Connect single-wire black/yellow plug (12) to single-wire receptacle (E) on stop button black or black/yellow wire (A). Install retainer (13) on single-wire connector. Install black ground wire ring terminal (H) on wiring harness (5) onto ignition coil ground (I) with stop button ground wire. Tighten screw securely. Remove black or black/yellow wire stop button socket (A) from "E" CAVITY (B) of five-wire plug (C). Install single-wire plug (12) from hardware kit onto stop switch wire socket (A). Install black/yellow wire socket (D) on wiring harness (5) into "E" CAVITY (b) of five-wire plug (C). Install retainer wire (13) on single-wire connector. Install black ground wire ring terminal (G) on wiring harness (5) onto ignition coil ground (H) with stop button ground wire. Tighten screw securely. Remove small "X" connector from stop switch wire. Assemble "D" connector (12) from hardware kit onto stop switch wire, and smaller "X" connector onto emergency stop switch. Assemble emergency stop switch connectors "C" and "X" into motor wiring as shown. 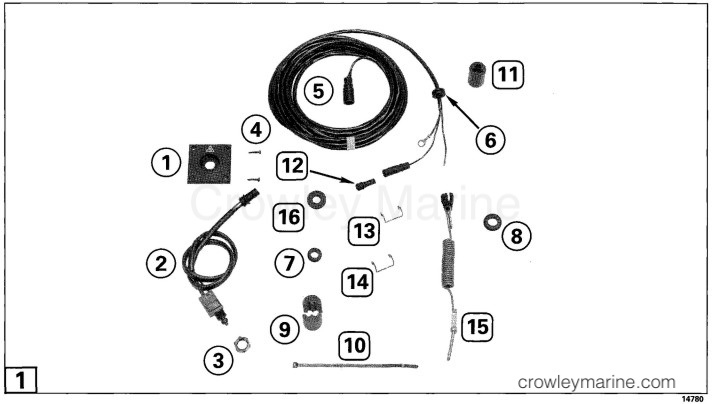 Install black ground wire ring terminal (E) on wiring harness onto ignition coil ground with stop button ground wire. Tighten screw to 48-96 in. lbs. (5,4-10,8 Nm). Disconnect "A-B" connectors. Install "D" connector (12) from hardware kit onto wiring harness wire. Assemble emergency stop switch connectors "C" and "D" into motor wiring as shown. Place Amphenol connectors in wire clamps, where used, or in lower motor cover. Check to see that wiring harness does not interfere with moving parts in motor cover. Route wiring harness from switch under gunwale and secure in place. Connect emergency stop switch to wiring harness. Secure with wire retainer (14). Any excess length of wiring harness should be coiled and taped up out of sight in a protected location. Provide sufficient slack at motor to permit steering and tilting of motor without interference. Install lanyard (15) on emergency stop switch. The emergency stop switch can only provide protection if it is connected and is working properly. 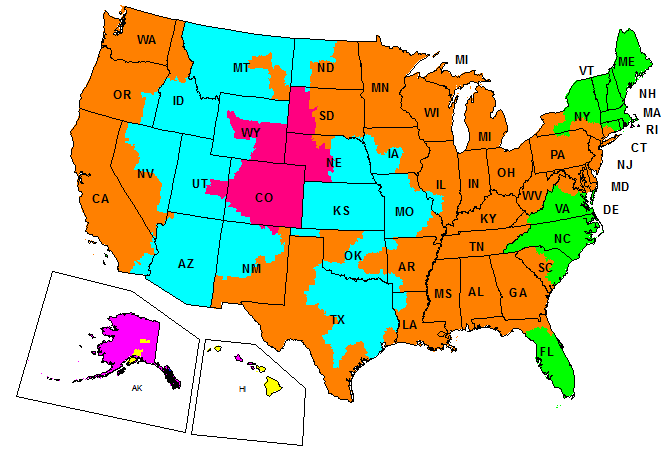 Test the switch after installation and periodically thereafter to maintain protection. Start motor and stop by pressing stop switch. If motor does not stop, repair before continuing. Start motor and stop by pulling off lanyard clip. If motor does not stop, repair before continuing. Give these instructions to the owner and explain the need for periodic checks of the emergency stop switch. If the lanyard is too long, it can be shortened by knotting or looping it. DO NOT cut and retie the lanyard to shorten it.